Nearly 5000 ancient coastal settlements have been identified so far. It may be accepted that all of them had some kind of boat landing or shelter. From a nautical point of view, many of these sites are not considered very good for sheltering modern yachts, but were nevertheless used in ancient times. Conversely, would you believe that a shelter that is considered today as “excellent” from a nautical point of view would not have been used in ancient times, at least as a bad weather refuge shelter? If such a place, in addition, provided fresh water and food, it could become more than a simple refuge. If it also had some “hinterland” providing trade opportunities, it could become a bigger city with sufficient resources to build specific port structures like breakwaters and quays. The aim of the present study is to list “Potential Ancient Harbours” defined as natural shelters that are considered ‘excellent’ by modern sailors but not (yet) listed as ancient harbours. The result is a list of over 200 places that might be further considered by historians and archaeologists to find out if they were indeed ancient settlements. This paper is also available as a pdf version. A few authors have been trying to define criteria for the location of ancient ports (Mauro, 2019). Some authors used geographical criteria (headlands, islands, bays, rivers) and other authors more specific criteria (protection from wind and waves, sea bed quality for anchoring, availability of water, salt and food). Nautical aspects were not often taken into consideration (except by Arnaud, 2005) although they are vital for seafarers. The purpose of this paper is to compare shelters considered as ‘excellent’ by modern yachtsmen with ancient shelters known by archaeology, and to identify locations that might be accepted as ‘Potential Ancient Harbours’ where archaeologists might have a look around. A ‘harbour’ is a place where ships can seek shelter. The concept of ‘shelter’ has to include anchorages, landing places on beaches, and ports including structures such as access channels, breakwaters, jetties, landing stages, quays, warehouses for storing of commodities and equipment, shipsheds and slipways. Shelters of interest include all places which may have been used by seafarers sailing over long distances. Villae maritimae are also of interest, but shelters the likes of local fishermen, who may have landed their boats on the beach in front of their homes, are of less interest. In another limitation, only maritime harbours and some river ports that could be reached by deep-sea ships are considered. This paper presents work done to collect, identify and locate ancient harbours and ports. It is based on a study of existing documentation, i.e. on the writings of 85 ancient authors and over 100 modern authors, incl. the Barrington Atlas. The ancient authors are usually historians, philosophers or poets, but for this work the geographers retained most of our attention: Strabo, Pausanias, Pliny the Elder, Ptolemy, Avienus, Mela and others, some anonymous, who tell about their journeys like ‘Antonine’, ‘Scylax’, ‘Scymnos’, Pythias, Hanno, Odysseus, Aeneas, Jason, Arrian in the Black Sea. In addition to ports mentioned by ancient authors, some ports have been included as mentioned by modern authors: Karl Lehmann-Hartleben (1923), Honor Frost (1963), David Blackman (1982 & 2014), Talbert’s Barrington Atlas (2000), Nic Flemming (1986), Getzel Cohen (1995 & 2006), Micha Tiverios (2008), Helen Dawson (2013), Anton Gordieiev (2015) and some up to date web sites (http://pleiades.stoa.org/ and http://dare.ht.lu.se/). In a first stage, only ports were listed that are explicitly mentioned by each ancient author (portus, navale, statio). Cities where the presence of a port was known from other sources were not attributed to an author who mentions the city but does not mention the port. This limitation was certainly questionable as one cannot imagine coastal settlements without at least a minimal shelter for boats. It was therefore decided to include all sites mentioned by the authors of a Periplus such as Stadiasmus, Antonine, Arrian and Marcian who were sailing ships and for whom one might consider that all places they mention are harbours. Furthermore, it was considered that all coastal settlements mentioned in the Barrington Atlas must have had a shelter, and they were included too. A list of nearly 5000 ancient ports and shelters was elaborated. They are scattered mainly around the Mediterranean Sea, but also in the North Sea, in the Atlantic Ocean, in the Red Sea and the Gulf and in the Indian Ocean. It can be viewed on: Catalogue of Ancient Ports. O: in calm weather only. Seafarers are intuitive people, they integrate all aspects to provide a judgment on the shelter quality. This judgment is of great value to us here. An excellent A-shelter provides all-round protection from wind, waves and currents, from all directions and at all times. This kind of protection from offshore waves is usually found inside bays with a narrow entrance and complex shape such as a “dog-leg”. Protection from wind is important also and usually depends on the land topography surrounding the shelter. Note that shelters are defined for modern sailing ships with modern sails and some ‘A-shelters’ might prove not that good for ancient ships with square sails. The work sequence was to list A-shelters and to check if each of them was or not recognised as one of the ancient harbours mentioned on the Catalogue of Ancient Ports. Therefore the 14 modern nautical guides, or “pilots” listed in the references hereafter have been searched. They contain over 4000 shelters, anchorages, marinas and commercial ports. Around 25% of them are excellent shelters. After comparing each of them with the Catalogue of Ancient Ports, a list of over 200 potential harbours was obtained for shelters that are not yet recognised as ancient harbours, but are good candidates from a nautical point of view. A list of over 200 sites was obtained from the comparison of ancient and modern shelters. It is summarised in the table below, grouping the numbers of Potential Ancient Harbours (PAH) for each area (a complete list is given at the end of this paper). The maps hereafter show that quite a lot of Potential Ancient Harbours are found in Greece, scattered on the mainland and on the islands. Concentrations of Potential Ancient Harbours are found in Croatia, on the Baleares islands and NE Sardinia. The Red Sea provides the largest number of Potential Ancient Harbours, but they are scattered all over the area, with a concentration of “marsas” in Northern Sudan. See also recent publication on ancient Black Sea ports. Everybody knows that a coral reef borders the Red Sea on almost its entire length. It is known also that the coral reef hates fresh water, polluted water and sediment and that it therefore is interrupted in places where large ‘wadis’ have their outlet into the sea. Such discontinuities of the reef provide deep water coves that can be used as shelters for ships. As a matter of fact, water is very deep (over 10 m) and the reef features a kind of vertical underwater cliff. I had an opportunity to swim in such a place in the nineties with my friend Xavier Bohl from Port Grimaud when we were asked to design a marina in a place now called Port Ghalib, and I confirm that it is an impressive swim as one cannot see the seabed although the water is crystal clean. Such a deep water cove is obviously not for anchorage, but the little beach inside the cove is suited for beaching. 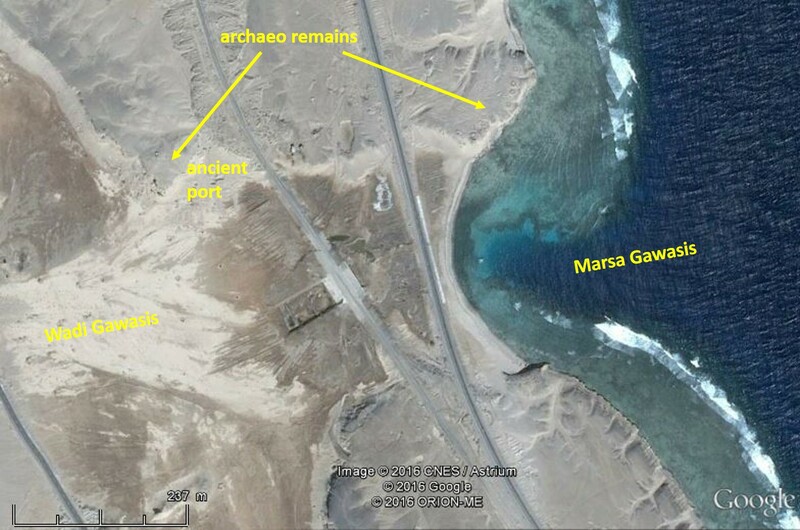 The Google Earth view below shows the Marsa Gawasis cove as an interruption of the coral reef, and wadi Gawasis flowing into the sea. 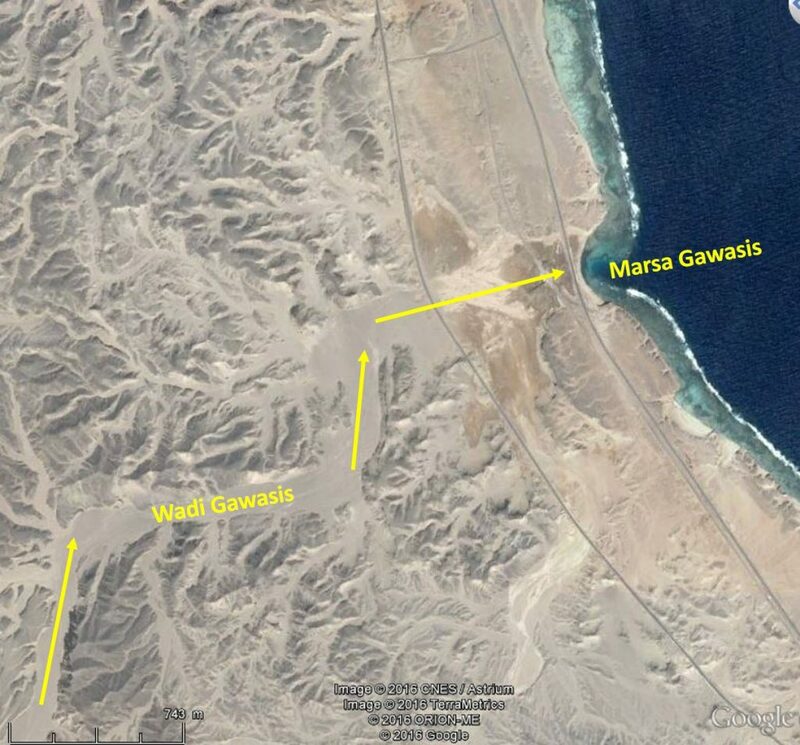 Wadi Gawasis flowing into the sea at Marsa Gawasis, generating an interruption of the coral reef. Archaeological remains and location of the ancient port about 300 m from the present coastline. The wadi outlet was filled with sediment provided by the wadi. have been there for 4000 years. Until recently, I thought wadis were wandering around and present coves were not ancient. However, I changed my mind when looking at Marsa Gawasis where recent archaeological finds show that this cove was used as a sea port in very ancient times 4000 years ago (Bard & Fattovich, 2007; Tallet, 2015). Other similar places where this can be seen are Wadi Safaga located 9 km North of Wadi Gawasis, a place possibly called Quei located 26 km South of Wadi Gawasis, Hamrawein port (possibly ancient Arsinoe Troglodytika), Quseir al-Qadim (ancient Myos Hormos), Marsa Dabr, Marsa Nakari (ancient Nechesia?). This new insight may help to identify other ‘potential ancient harbours’. This does of course not mean that an ancient port will be found in each present cove on the Red Sea coast, but it may be worth listing them in order to have a closer look for archaeological remains in these places in the future. Note that many of these coves are used today for holiday resorts and diving centres which may be a sign of good shelter. Here is the list for the stretch between Hurghada and Ras Banas (400 km). This stretch was chosen because it is the most likely area where ships would stop fighting against the northern wind when returning from their trip to the Land of Punt, and would unload their precious cargo to continue over land to the Nile river. * place names are taken from Google Earth and may contain some approximations. Homeric seafarers often used beaches to land their ships on. It may be noted that a 35 m penteconter with 50 ‘strong’ oarsmen could be hauled on the beach if the slope was mild enough, say no more than 1:10, or 10%, or 6° (the steepest man-made slipways had a slope of 1:6 acc. Blackman, 2013). This requires sand of a certain grain size (Komar, 1998): the very fine sands (or silts) found in large deltas yield a very flat slope which keeps ships far from land. Conversely, a shingle beach has a steep slope that is dangerous for landing ships on. With increasing ship sizes (and weights), beaching became unpractical, if not unfeasible, and places for safe anchorage were sought (see Greg Votruba, 2017). During Athenian military expeditions, 200 people had to be fed on board triremes. It was impossible for ship masters to fill their ships with tons of food. In the absence of ports, ship pilots had to find beaches with a degree of shelter where drinking water could be found, and river estuaries could provide both. The Stadiasmus is an example of a collection of such knowledge and can be considered as the ancestor of medieval portolans and modern nautical instructions. Commercial ships obviously preferred sheltered creeks, possibly with some kind of jetty, as their ships were too heavy to be pulled on the beach. Seafarers obviously preferred shelters with clear landmarks on shore (such as a typical mountain) and many shelters were needed, as seafarers often followed the coast, using safe shelters to stop overnight and escape bad weather. Even though they could sail 50 to 100 nautical miles in a day, it was important to know where they could find safe shelter within two to three hours of navigation, i.e. only approx. 10 miles. beaches are subject to sedimentation and erosion by wave action, and the latter explains why some ancient ports were lost to the sea (e.g. in The Netherlands, Tunisia). It should be noted also that ancient ports mentioned here have been collected from texts of various dates ranging from 1500 BC to 500 AD (with a few exceptions), that is 2000 years. The various authors have not seen the same things … and some authors have just repeated what others wrote before them! The aim of this study is not to provide a comprehensive list of yet unknown Potential Ancient Harbours based on rational and scientific deductions, but rather to list places that might be further investigated by historians and archaeologists. The somewhat intuitive methods used here do not give any proof, but just an indication of Potential Ancient Harbours. some nautical guides did not survey the smaller anchorages (e.g. North Africa). Without insult to the modern authors of the nautical guides, it can be said that the ancient Stadiasmus includes more places than the modern pilot of the North African coast between Carthage and Alexandria! The same holds for Arrian’s periplus of the Black Sea. Conversely, some areas show many potential ancient harbours. This is probably due to a reversed combination of the above factors, e.g. in the Red Sea, Croatia where ancient sources are inaccurate, if any, and modern pilots are quite detailed. The Catalogue of Ancient Ports & Harbours tries to be exhaustive, but is most probably not. Hence, some Potential Ancient Harbours listed here may be recognised by some expert as ancient harbours already known to him and the present author will be delighted to hear about that in order to remove such places from the list of “potential” ancient harbours. However, large parts of the listed Potential Ancient Harbours are probably real newcomers and will definitely require more attention from historians and archaeologists to find out if they were indeed ancient settlements. Some of these places may not show a single sign of ancient presence at the anchorage or on land because erosion may have taken away all remains; they will therefore remain “potential” ancient harbours. Hopefully, other places will provide more evidence of ancient human presence (amphorae, stone anchors, ballast stones, etc.) even if this evidence may be difficult to find as it may be under water and buried under thick layers of sediment. Bard, K. & Fattovich, R., (2007), “Spatial Use of the Twelfth Dynasty Harbor at Mersa/WadiGawasis for the Seafaring Expeditions to Punt”, Journal of Ancient Egyptian Interconnections, Vol. 2:3, 2010, pp 1-13. Tallet, P., (2015), « Les « ports intermittents » de la mer Rouge à l’époque pharaonique : caractéristiques et chronologie », Nehet 3, 2015, pp 31-72.